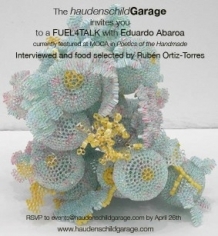 On April 28, 2007 the haudenschildGarage held a FUEL4TALK with Eduardo Abaroa titled The Paint's Almost Dry in Los Angeles. This FUEL4TALK was meant as a fluid discussion-based context to bring up the issues that emerged in the presentation-based Mexico City in the 1990s: The Paint's Not Dry conference at the haudenschildGarage of 2005. The organizers hoped that through a small group discussion, things might be more open and flexible then they were in the previous "glamorous" effort at UCSD. Eduardo Abaroa was the focal point of a small group discussion organized and moderated by Steve Fagin and Ruben Ortiz-Torres in conjunction with Roberto Tejada and Yoshua Okon. The 1990s in Mexico City were a period of tremendous political upheaval and incredible cultural energy. The art that grew out of that was socially interactive. Today, that art is internationally recognized. But does that mean it might lose its living spirit? The goal of this conference is to take a breath before the art has become 'official, important art.' We want to recapture its undergroundedness, its funkiness - and its politics. Is the image of Mexico City circa 1995 no longer one of experimentation and anarchy-or of putting whatever together? Without us noticing, has it now been refigured as a minor capital of arriviste entitlement? To what degree are "we" willing to settle for only this Mexico City, a dot on the map of the moveable feast that is the art world's list of usual suspects: "If it's Tuesday, it must be____________. (Fill in the blank with GATT member wannabe of your choice.)" With "Before the Paint's Dry," we wish to revisit 1990s Mexico City: bars, cantinas, the pre-"Fondesa" cafes, alternate spaces, "bad music," and strong opinions. What stories and histories and political interventions were being imagined-and are still to be written now? We wish to convene a día de los muertos to see if this corpse called Distrito Federal can still sing a calavera to us from the mid-1990s in a charmed and off-tune timbre: tuba as melody; tambor militar as rhythm. Mexico City, circa 1990s: The art scene was blooming and bleeding-edge - and as complex and messy as those adjectives imply. Before the story is sanitized and boiled down to a simple chapter in an art-history tome, the Visual Arts Department of the University of California, San Diego is convening some of the scene's leading participants to argue alternative accounts.